Antibodies to gliadin, a component of gluten, have frequently been reported in schizophrenia. Highly immunogenic B cell epitopes along its length are homologous to numerous proteins relevant to schizophrenia, including members of the DISC1 interactome, glutamate, dopamine and neuregulin signalling networks, and plasticity or myelination pathways.� Antibodies to gliadin may cross react with these key proteins, as has already been observed with synapsin 1 and calreticulin. �Gliadin may thus be a causative agent in schizophrenia, under certain genetic and immunological conditions, producing its effects via antibody mediated knockdown of multiple proteins relevant to the disease process. Because of such homology, an autoimmune response may be sustained by the human antigens that resemble gliadin itself, a scenario supported by many reports of immune activation both in the brain and in lymphocytes in schizophrenia.� �Gluten free diets and removal of such antibodies may be of therapeutic benefit in certain cases of schizophrenia. A number of studies from� China, Norway, and the USA have reported the presence of gliadin antibodies in schizophrenia 1-5 . Gliadin is a component of gluten, intolerance to which is implicated in coeliac disease 6 . Both gluten intolerance and coeliac disease have �also been associated with schizophrenia � 7, 8 , and remission of schizophrenia, in specific subsets of patients , has occasionally been reported following the instigation of a gluten-free diet 9, 10 . Gliadin is a polyglutamine repeat protein (Fig 1), and de facto, a homologue of the mutant polyglutamine proteins in Huntington�s disease, Dentatorubropallidoluysian atrophy (DRPLA) , spinal and Bulbar Muscular Atrophy (Kennedy disease) and Spinocerebellar ataxias 11 . Gliadin antibodies have also been found in Huntington�s disease and spinocerebellar ataxias and gluten per se has been associated with various forms of ataxia 12 13 . These studies may implicate gliadin in the pathology of these diseases. This is not the subject of this article. As reported below, polyglutamine repeats are highly immunogenic, the more so with each addition of glutamine. A number of schizophrenia susceptibility gene products contain polyglutamine repeats, while others also display a high degree of homology to other regions of gliadin. Gliadin antibodies may thus play a role in the pathology of schizophrenia by cross-reactive targeting of key schizophrenia-related proteins. Gliadin is a polyglutamine (polyQ) repeat protein with an internal contiguous sequence of 22 glutamines (Fig 1). Gliadin is highly immunogenic and 181/296 (61%) of its residues are considered as B cell epitopes with the server-defined cut off index of 0.35 (Fig 2). http://www.polygenicpathways.co.uk/gliadin.htm. Polyglutamine repeats are also immunogenic, and all are above the threshold of 0.35 (Fig 2). The antigenicity increases with the number of glutamine repeats. The BLAST of gliadin (whole protein) versus the human proteome yielded 29 significant results, again including highly relevant proteins, many, but not all, influenced by the polyglutamine repeat (Table 1). These proteins belong to members of the DISC1 interactome and also include pre- and postsynaptic proteins related to glutamate, GABA, and neuregulin signalling. They are also involved in dopaminergic function, myelination, and dendritic spine development and to neurogenesis, inflammation and oxidative stress (Fig 3). �A more detailed analysis revealed an interesting type of homology that is common to many more proteins than are listed in Table 1. 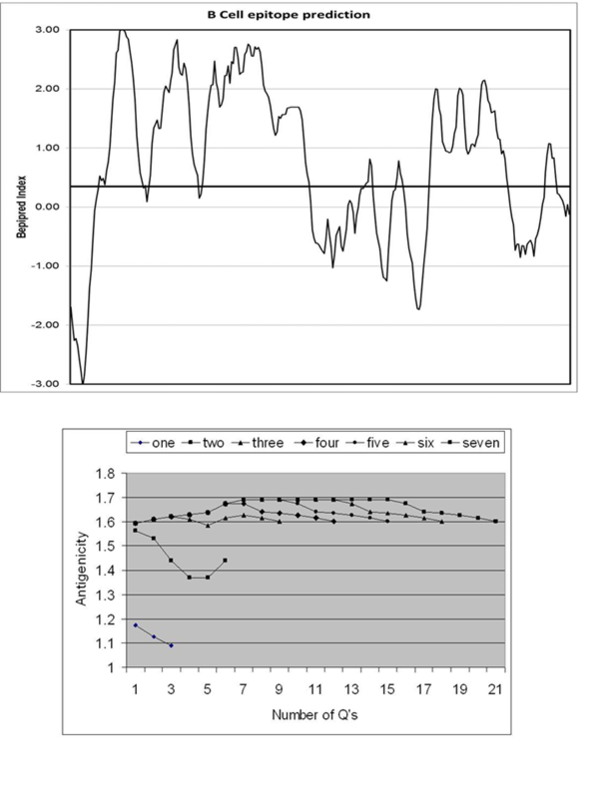 This is exemplified in Fig 4. The Clustal alignment of KCNN3 with gliadin shows a non-extensive homology with 18% amino acid identity shared by the two proteins, within the homologous region. The gliadin protein is characterised by many short repeat motifs, other than polyglutamines. These include (PQPQP) *4 ;(PQPQ) *5; (QPQP)*5; �(PQQP)*2; (QQPY)*2; (QPQPQ)*2; �(QQQQF)*2 and (VLQQ)*2. Some of these motifs can also be found in the KCNN3 protein, which, with the polyglutamine repeat contains 9 such areas of identity, many concentrated in a 13 amino acid contiguous tridecapeptide (QPQPPQLQQQQ). The overall gliadin/KCNN3 identity including these contiguous peptides is 5.3%. However, these matching gliadin/KCNN3 motifs extend over the whole length of the gliadin protein, which displays 31% identity with these KCNN3 fragments. These fragments are mostly (12/15) within highly immunogenic regions of the gliadin protein. Because this immunogenicity extends over many different regions, several different antibodies to gliadin or to its partially digested fragments are likely to be produced. These repeat motifs and their presence in human proteins are likely to dramatically increase the likelihood of cross-reactivity between gliadin, gliadin fragments and human antigens. These areas in human proteins were identified by sequential BLASTS of contiguous 25 amino acid fragments, along the length of the gliadin protein, each BLAST overlapping by 5 amino acids. By plotting these homologues along the length of the gliadin protein, these multiple repeats and their antigenicity could be identified simultaneously. In all, a total of 459 human proteins contain at least one of these tetrapeptide matches, 60 with pentapeptide matches, and others with longer contiguous matches as shown in Table 2. This procedure allowed the definition of the number of gliadin matches within each human protein, and of the antigenic index of each of these matches. These results, for 5 or more matches are shown in Table 3: FOXP2, SMARCA2, NUMBL, KCNN3, and RAI1 contain from 14 to 22 of such matches. Certain key gene products including DISC1, neuregulin 2, dysbindin and synapsin 2 contain 5 or more of these gliadin consensus sequences. In fact, of the 459 proteins identified, 158 (34%) are the products of genes listed as susceptibility candidates in association studies. (See http://www.polygenicpathways.co.uk/gliadin.htm for details) �An example of peptide matching to the antigenicity profile is shown in Fig 5 for KCNN3. This also allowed antigenicity mapping by family as shown in for glutamate related proteins or for myelin related proteins, many of which match gliadin in highly immunogenic regions (Fig 6). A number of autoantibodies have been reported in schizophrenia. Their targets include the dopamine (DRD2) 14 , glutamate (GRIN1) 15 , acetylcholine (CHRNA7) 16 and� opioid (OPRM1) receptors� 17 , heat shock protein 60 (HSPD1) 18 and hsp90 (HSP90A1) 19 , �MYC binding protein 2 (MYCBP2)� 18 nerve growth factor (NGF) � 20 and striatin (STRN) 21 all of which are homologous to gliadin, with MYCBP2 and striatin particularly well represented (Fig 7). Myc inhibits myelination, and is also involved in dendrite and synapse formation 22, 23 . Striatin plays an important role in dendritic spine development 24 . The high immunogenicity of gliadin, over almost its entire length, suggests that multiple antibodies could be formed by presentation of diverse antigens in different cellular and tissue compartments. Such antibodies might be produced to the entire protein, or to its partially digested fragments. The homology with key schizophrenia related proteins, often covering many regions of gliadin is striking and suggests that gliadin antibodies could also target these human proteins. Indeed 9 of the autoantigens reported in schizophrenia patients are homologous to gliadin. It has also been shown that gliadin antibodies cross react with calreticulin and synapsin 1 25, 26 . Synapsin 1 was homologous to the particular gliadin tested (PQQQP, PQQP and PLQQ) while calreticulin was not. It was however homologous to gamma gliadins from Triticum aestivum and Triticum urartu (VPRD), Triticum monococcum (VRPD) and a related goat grass, Aegilops searsii (PVIQ). These homologous sequences are short, and in most cases, tetrapeptides, although higher degrees of homology were observed in many proteins (from 5 to 9 amino acids, not including polyglutamine repeats (Table 2). Antibodies are quite capable of binding to such short epitopes 27 . In addition the repeat motifs in gliadin have already been noted and are, per se, immunogenic 28 . The key pathological features of schizophrenia include reduced dendritic spine density and synaptic poverty 29 , deficits in myelination and oligodendrocyte cell loss 30, 31 , impaired neuregulin signalling 32 and imbalances in glutamate and dopamine neurotransmission 33 . Many gene products covering these networks are homologous to gliadin. The DISC1 network, connected to many of these areas 34 is also clearly targeted by gliadin homologues (Fig 1). Antibodies are able to enter the brain via blood-brain barrier �transporters 35 and can also enter cells via a high affinity immunoglobulin receptor, tripartite motif-containing 21 (TRIM21) 36 . This suggests that antibody related protein knockdown, of multiple proteins relevant to schizophrenia could be a direct consequence of gliadin allergy. Many studies have reported evidence of immune activation in schizophrenia patients, both in the brain 37, 38 �and in lymphocytes 39, 40 , and autoimmune attack of certain cells may well explain some of the ongoing pathology of schizophrenia, for example oligodendrocyte� 30 and grey matter loss 41 . Following digestion, gliadin will be broken into peptide fragments that may also find their way into the brain via the circulation, and uptake via peptide transporters. As partial homologues of many relevant proteins, they may also be able to interfere with the signalling processes controlled by these proteins. Several pharmacological effects of gliadin or gluten have indeed been noted. For example gluten peptides have opioid activity 42 : Gliadin peptides are also able to activate protein kinase A 43 and bind to the chemokine receptor CXCR3 44 . They are also able to interfere with epidermal growth factor signalling in a number of cell lines 45 and activate nuclear factor kappa beta signalling in monocytes 46 . This type of homology with human proteins may apply to allergens in general, whose deleterious effects are not necessarily restricted to immune activation, but also to the possibility of interaction with a multitude of host proteins that they resemble. Similar protein matches are found in many proteins expressed by the viruses implicated in Alzheimer�s disease 47 or schizophrenia, and indeed these viral consensus sequences tend to be longer. For example hexapeptide identity between influenza viral proteins and several schizophrenia relevant proteins has been noted: These include reelin, neurexin 1-alpha and DISC1 48 . In fact several hundred schizophrenia susceptibility gene products display this type of homology to diverse viruses and parasites (T.Gondii and B. Burgdorferri) implicated as risk factors in schizophrenia. It has recently been shown that DNA from many common non-retroviral viruses is integrated into mammalian genomes 49 . BLAST analyses of the human proteome also shows that thousands of human proteins contain these viral (or in this case allergen) contiguous matching sequences. �Indeed this type of viral homology appears to cover the entire human genome. (See http://www.polygenicpathways.co.uk/blasts.htm ). The human proteome has been estimated to contain ~33869 proteins with an average length of 375 amino acids 50 . For pentapeptide matches, this yields a figure of 370*33869 potential matching blocks (12.53 million). These building blocks are identical to those in viral, bacterial, fungal and allergen proteins. Upon infection or ingestion, these pathogenic proteins are likely to seed havoc in the panoply of the host�s signalling networks via the mechanisms described above, and are likely to contribute to the pathology of many human diseases. Clearly gliadin, a major dietary component, cannot cause schizophrenia in all cases. �Gluten intolerance and gliadin allergy are evidently related to the immune system. Many immune related susceptibility genes (few of which were encountered in this study) have been reported in association studies, including genome-wide association studies 51 . The high proportion of other types of schizophrenia susceptibility gene products related to gliadin suggests that those genes that encode for proteins with gliadin homology may be considered as risk factors if and when their products are homologous to a particular form of gliadin. Many different forms of gliadin, from diverse plant and bacterial species exist, as do many polymorphic genes, and their resultant differing protein sequences. The marriage of genes and risk factors, and the status of our immune system are thus three variables whose convergence may be obligatory to initiate the processes described above. Gliadin antibodies and gluten intolerance have often been associated with schizophrenia, and in some cases a gluten free diet has been reported to evoke the remission of symptoms (see introduction).� These data suggest that this is more than a simple association and that gliadin antibodies could well be the causative agent of schizophrenia in genetically and immunologically compromised individuals, and illustrate how this might be achieved. If so, then the instigation of a gluten free diet, as already shown 9, 10 , may be an effective substitute for drug related interventions. However in certain cases, even if gliadin is removed, the homologous human proteins might well be able to sustain the production of further antibodies, due to the permanence of autoantigens in the human biological network. Antigen and antibody removal by immunoadsorption techniques, or immunosuppression, might thus prove to be effective therapies. Ways of identifying the subsets of patients, who might benefit from such strategies, including routine antibody detection, may have a marked effect on the prevalence and severity of schizophrenia. Acknowledgements: I would like to thank the many authors who have provided reprints and encouragement. Gliadin is a polyglutamine (polyQ) repeat protein with an internal stretch of 22 glutamines. This sequence as well as gliadin or gliadin internal fragments were screened against the human proteome using the filters �schizophrenia�, �glutamate�, �dopamine� or �myelin� to trawl for proteins that might be related to gliadin (BlastP) 52 . Without these filters, many other polyglutamine proteins (Huntingtin, ataxins, the androgen receptor etc.) masked any underlying results. B-Cell epitopes within the gliadin protein were identified using the BepiPred server http://www.cbs.dtu.dk/services/BepiPred/, which predicts antigenicity related to the charge and hydrophobicity properties of the peptide 53 . The BLAST results and supplementary data can be visualised at http://www.polygenicpathways.co.uk/gliadin.htm where a NextBio highlighting tool provides details for all gene symbol abbreviations. Little is known about this protein: However it binds to MAP6,� a microtubule protein that controls synaptic organisation, in particular of glutamatergic synapses where it controls the expression of the glutamate transporter and presynaptic genes , synaptophysin and GAP-43 ,� spinophilin and MAP2 63 . Plays an important role in the immune system and in water� homoeostasis : Polydipsia (excessive water drinking) and water imbalance have been observed in schizophrenia 143, 144 . Fig 1: The sequence of the gliadin protein used in this study: Polyglutamine or other repeat sequences are highlighted in bold or in grey. 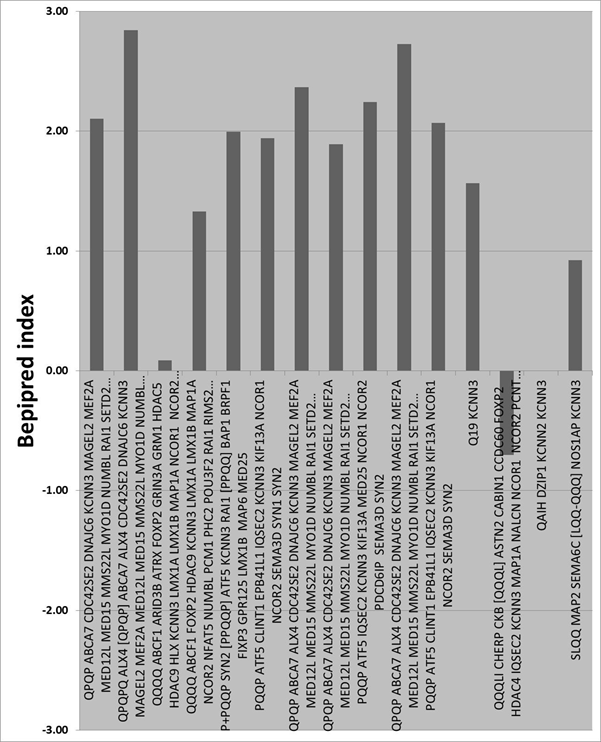 The B cell epitope index values of the gliadin protein (amino acid 1-276) as predicted by the Bepipred server. The cut-off value of 0.35 is illustrated by the thick horizontal line. An interactome network for the proteins identified in this study. Proteins in grey boxes show a significant degree of homology with gliadin in the BLAST analyses, or are polyglutamine repeat proteins. Linked boxes represent binding between two components; these data were gleaned from the protein interaction section of Entrez Gene. Arrows indicate other effects on transcription or other functional effects. See Table 1 for details. The B cell epitope index for KCNN3 sequences within the gliadin protein. Other human proteins trapped in passing are also shown. The B cell epitope indices for sequences of glutamate (top)� and myelin related proteins (bottom) sharing consensus sequences with gliadin. The B cell epitope indices for sequences of schizophrenia-related autoantigens sharing consensus sequences with gliadin. �������� 1.�� �������� Jin,S.Z. et al. A Study of Circulating Gliadin Antibodies in Schizophrenia Among a Chinese Population. Schizophr. Bull.(2010). �������� 2.�� �������� Samaroo,D. �et al. Novel immune response to gluten in individuals with schizophrenia. Schizophr. Res. 118, 248-255 (2010). �������� 3.�� �������� Cascella,N.G. et al. Prevalence of Celiac Disease and Gluten Sensitivity in the United States Clinical Antipsychotic Trials of Intervention Effectiveness Study Population. Schizophr. Bull.(2009). �������� 4.�� �������� Reichelt,K.L. & Landmark,J. Specific IgA antibody increases in schizophrenia. Biol. Psychiatry. 37, 410-413 (1995). �������� 5.�� �������� Dohan,F.C., Martin,L., Grasberger,J.C., Boehme,D., & Cottrell,J.C. Antibodies to wheat gliadin in blood of psychiatric patients: possible role of emotional factors. Biol. Psychiatry. 5, 127-137 (1972). �������� 6.�� �������� Tjon,J.M., van Bergen,J., & Koning,F. Celiac disease: how complicated can it get? Immunogenetics. 62, 641-651 (2010). �������� 7.�� �������� Samaroo,D. �et al. Novel immune response to gluten in individuals with schizophrenia. Schizophr. Res. 118, 248-255 (2010). �������� 8.�� �������� Cascella,N.G. et al. Prevalence of Celiac Disease and Gluten Sensitivity in the United States Clinical Antipsychotic Trials of Intervention Effectiveness Study Population. Schizophr. Bull.(2009). �������� 9.�� �������� Kalaydjian,A.E., Eaton,W., Cascella,N., & Fasano,A. The gluten connection: the association between schizophrenia and celiac disease. Acta Psychiatr. Scand. 113, 82-90 (2006). ����� 10.�� �������� Kraft,B.D. & Westman,E.C. Schizophrenia, gluten, and low-carbohydrate, ketogenic diets: a case report and review of the literature. Nutr. Metab (Lond). 6, 10 (2009). ����� 11.�� �������� Robertson,A.L., Bate,M.A., Androulakis,S.G., Bottomley,S.P., & Buckle,A.M. PolyQ: a database describing the sequence and domain context of polyglutamine repeats in proteins. Nucleic Acids Res.(2010). ����� 12.�� �������� Bushara,K.O., Nance,M., & Gomez,C.M. Antigliadin antibodies in Huntington's disease. Neurology. 62, 132-133 (2004). ����� 13.�� �������� Hadjivassiliou,M. et al. Gluten ataxia in perspective: epidemiology, genetic susceptibility and clinical characteristics. Brain. 126, 685-691 (2003). ����� 14.�� �������� Buka,S.L., Cannon,T.D., Torrey,E.F., & Yolken,R.H. Maternal exposure to herpes simplex virus and risk of psychosis among adult offspring. Biol. Psychiatry. 63, 809-815 (2008). ����� 15.�� �������� Suzuki,Y., Kurita,T., Sakurai,K., Takeda,Y., & Koyama,T. [Case report of anti-NMDA receptor encephalitis suspected of schizophrenia]. Seishin Shinkeigaku Zasshi. 111, 1479-1484 (2009). ����� 16.�� �������� Chandley,M.J., Miller,M.N., Kwasigroch,C.N., Wilson,T.D., & Miller,B.E. Increased antibodies for the alpha7 subunit of the nicotinic receptor in schizophrenia. Schizophr. Res. 109, 98-101 (2009). ����� 17.�� �������� Tanaka,S. �et al. Autoantibodies against four kinds of neurotransmitter receptors in psychiatric disorders. J. Neuroimmunol. 141, 155-164 (2003). ����� 18.�� �������� Wang,X.F. �et al. Studies characterizing 60 kda autoantibodies in subjects with schizophrenia. Biol. Psychiatry. 53, 361-375 (2003). ����� 19.�� �������� Kim,J.J. et al. Identification of antibodies to heat shock proteins 90 kDa and 70 kDa in patients with schizophrenia. Schizophr. Res. 52, 127-135 (2001). ����� 20.�� �������� Shcherbakova,I.V. et al. Leukocyte elastase and autoantibodies to nerve growth factor in the acute phase of schizophrenia and their relationship to symptomatology. World J. Biol Psychiatry. �5, 143-148 (2004). ����� 21.�� �������� Poletaev,A.B., Morozov,S.G., Gnedenko,B.B., Zlunikin,V.M., & Korzhenevskey,D.A. Serum anti-S100b, anti-GFAP and anti-NGF autoantibodies of IgG class in healthy persons and patients with mental and neurological disorders. Autoimmunity. 32, 33-38 (2000). ����� 22.�� �������� Jensen,N.A., Pedersen,K.M., Celis,J.E., & West,M.J. Failure of central nervous system myelination in MBP/c-myc transgenic mice: evidence for c-myc cytotoxicity. Oncogene. 16, 2123-2129 (1998). ����� 23.�� �������� Proepper,C. et al. Abelson interacting protein 1 (Abi-1) is essential for dendrite morphogenesis and synapse formation. EMBO J. 26, 1397-1409 (2007). ����� 24.� ��������� Benoist,M., Gaillard,S., & Castets,F. The striatin family: a new signaling platform in dendritic spines. J. Physiol Paris. 99, 146-153 (2006). ����� 25.�� �������� Tuckova,L. et al. Anti-gliadin antibodies in patients with celiac disease cross-react with enterocytes and human calreticulin. Clin. Immunol. Immunopathol. 85, 289-296 (1997). ����� 26.�� �������� Alaedini,A. et al. Immune cross-reactivity in celiac disease: anti-gliadin antibodies bind to neuronal synapsin I. J. Immunol. 178, 6590-6595 (2007). ����� 27.�� �������� Agarwal,A., Sarkar,S., Nazabal,C., Balasundaram,G., & Rao,K.V. B cell responses to a peptide epitope. I. The cellular basis for restricted recognition. J. Immunol. 157, 2779-2788 (1996). ����� 28.�� �������� Marsh,M.N. Gluten, major histocompatibility complex, and the small intestine. A molecular and immunobiologic approach to the spectrum of gluten sensitivity ('celiac sprue'). Gastroenterology. 102, 330-354 (1992). ����� 29.�� �������� Garey,L.J. et al. Reduced dendritic spine density on cerebral cortical pyramidal neurons in schizophrenia. J. Neurol. Neurosurg. Psychiatry. 65, 446-453 (1998). ����� 30.�� �������� Uranova,N.A. et al. The role of oligodendrocyte pathology in schizophrenia. Int. J. Neuropsychopharmacol. 10, 537-545 (2007). ����� 31.�� �������� Uranova,N.A., Vostrikov,V.M., Orlovskaya,D.D., & Rachmanova,V.I. Oligodendroglial density in the prefrontal cortex in schizophrenia and mood disorders: a study from the Stanley Neuropathology Consortium. Schizophr. Res. 67, 269-275 (2004). ����� 32.�� �������� Buonanno,A. et al. Neuregulins and neuronal plasticity: possible relevance in schizophrenia. Novartis. Found. Symp. 289, 165-177 (2008). ����� 33.�� �������� Seeman,P. Glutamate and dopamine components in schizophrenia. J. Psychiatry Neurosci. 34, 143-149 (2009). ����� 34.�� �������� Hennah,W. & Porteous,D. 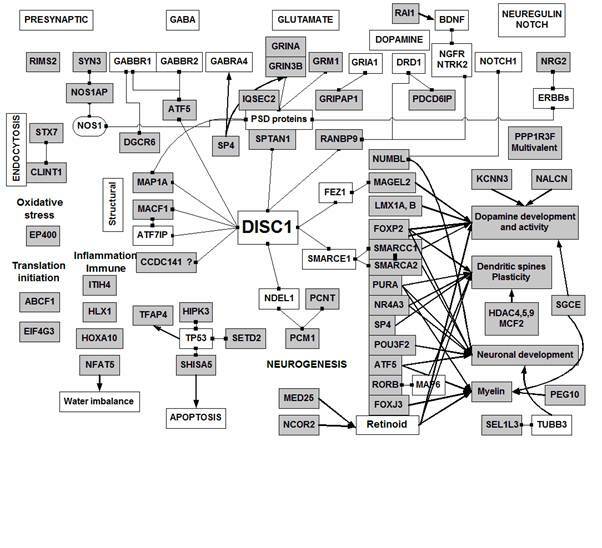 The DISC1 pathway modulates expression of neurodevelopmental, synaptogenic and sensory perception genes. PLoS. One. 4, e4906 (2009). ����� 35.�� �������� Pardridge,W.M. Re-engineering biopharmaceuticals for delivery to brain with molecular Trojan horses. Bioconjug. Chem. 19, 1327-1338 (2008). ����� 36.�� �������� Male,D., Brostoff.J, Roth,D., & Roitt,I. Immunology(Elsevier,2010). ����� 37.�� �������� Patterson,P.H. Immune involvement in schizophrenia and autism: etiology, pathology and animal models. Behav. Brain Res. 204, 313-321 (2009). ����� 38.�� �������� Rothermundt,M., Arolt,V., & Bayer,T.A. Review of immunological and immunopathological findings in schizophrenia. Brain Behav. Immun. 15, 319-339 (2001). ����� 39.�� �������� Ganguli,R., Rabin,B.S., Kelly,R.H., Lyte,M., & Ragu,U. Clinical and laboratory evidence of autoimmunity in acute schizophrenia. Ann. N. Y. Acad. Sci. 496, 676-685 (1987). ����� 40.�� �������� O'Donnell,M.C. et al. Increased production of interleukin-2 (IL-2) but not soluble interleukin-2 receptors (sIL-2R) in unmedicated patients with schizophrenia and schizophreniform disorder. Psychiatry Res. 65, 171-178 (1996). ����� 41.�� �������� Thompson,P.M. et al. Mapping cortical change in Alzheimer's disease, brain development, and schizophrenia. Neuroimage. 23 Suppl 1, S2-18 (2004). ����� 42.�� �������� Huebner,F.R., Lieberman,K.W., Rubino,R.P., & Wall,J.S. Demonstration of high opioid-like activity in isolated peptides from wheat gluten hydrolysates. Peptides. 5, 1139-1147 (1984). ����� 43.�� �������� Laparra Llopis,J.M. & Sanz,H.Y. Gliadins induce TNFalpha production through cAMP-dependent protein kinase A activation in intestinal cells (Caco-2). J. Physiol Biochem. 66, 153-159 (2010). ����� 44.�� �������� Lammers,K.M. et al. Gliadin induces an increase in intestinal permeability and zonulin release by binding to the chemokine receptor CXCR3. Gastroenterology. 135, 194-204 (2008). ����� 45.�� �������� Barone,M.V. et al. Growth factor-like activity of gliadin, an alimentary protein: implications for coeliac disease. Gut. 56, 480-488 (2007). ����� 46.�� �������� Jelinkova,L., Tuckova,L., Cinova,J., Flegelova,Z., & Tlaskalova-Hogenova,H. Gliadin stimulates human monocytes to production of IL-8 and TNF-alpha through a mechanism involving NF-kappaB. FEBS Lett. 571, 81-85 (2004). ����� 47.�� �������� Carter,C.J. Alzheimer's disease: A pathogenetic autoimmune disorder caused by Herpes simplex in a gene-dependent manner. Int. J. Alz. Dis in press, (2010). ����� 48.�� �������� Kanduc,D. Describing the hexapeptide identity platform between the influenza A H5N1 and Homo sapiens proteomes. Biologics. 4, 245-261 (2010). ����� 49.�� �������� Katzourakis,A. & Gifford,R.J. Endogenous Viral Elements in Animal Genomes. Plos. Genet. 6, e1001191. doi:10.1371/journal.pgen.1001191 (2010). ����� 50.�� �������� Brocchieri,L. & Karlin,S. Protein length in eukaryotic and prokaryotic proteomes. Nucleic Acids Res. 33, 3390-3400 (2005). ����� 51.�� �������� Jia,P., Wang,L., Meltzer,H.Y., & Zhao,Z. 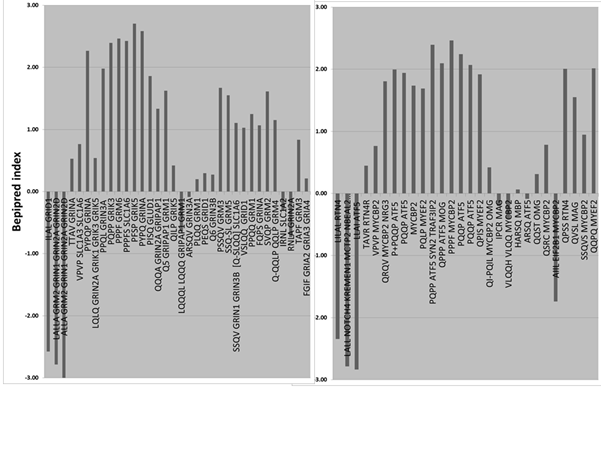 Common variants conferring risk of schizophrenia: a pathway analysis of GWAS data. Schizophr. Res. 122, 38-42 (2010). ����� 52.�� �������� Altschul,S.F. et al. Gapped BLAST and PSI-BLAST: a new generation of protein database search programs. Nucleic Acids Res. 25, 3389-3402 (1997). ����� 53.�� �������� Larsen,J.E., Lund,O., & Nielsen,M. 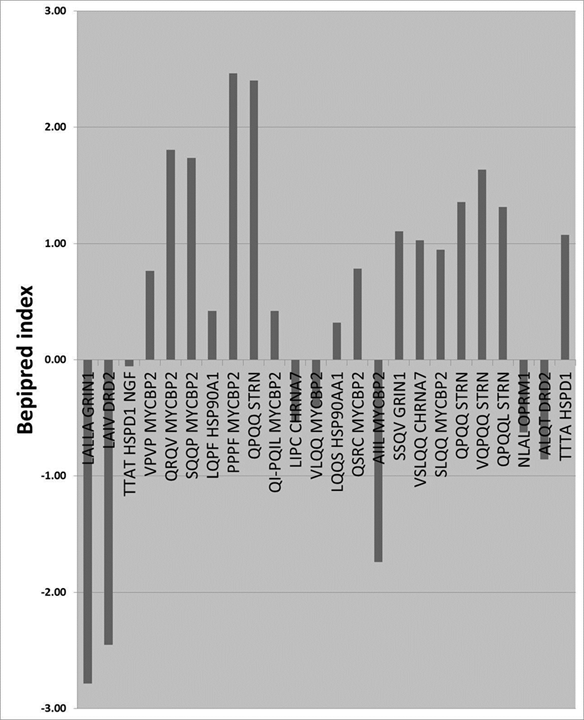 Improved method for predicting linear B-cell epitopes. �Immunome. Res. 2, 2 (2006). ����� 54.�� �������� Bendel,O., Meijer,B., Hurd,Y., & von Euler,G. Cloning and expression of the human NMDA receptor subunit NR3B in the adult human hippocampus. Neurosci. Lett. 377, 31-36 (2005). ����� 55.�� �������� Sakagami,H. et al. IQ-ArfGEF/BRAG1 is a guanine nucleotide exchange factor for Arf6 that interacts with PSD-95 at postsynaptic density of excitatory synapses. Neurosci. Res. 60, 199-212 (2008). ����� 56.�� �������� Jaffrey,S.R., Benfenati,F., Snowman,A.M., Czernik,A.J., & Snyder,S.H. Neuronal nitric-oxide synthase localization mediated by a ternary complex with synapsin and CAPON. Proc. Natl. Acad. Sci. U. S. A. 99, 3199-3204 (2002). ����� 57.�� �������� Carrel,D. �et al. NOS1AP regulates dendrite patterning of hippocampal neurons through a carboxypeptidase E-mediated pathway. J. Neurosci. 29, 8248-8258 (2009). ����� 58.�� �������� Schoch,S. �et al. Redundant functions of RIM1alpha and RIM2alpha in Ca(2+)-triggered neurotransmitter release. EMBO J. 25, 5852-5863 (2006). ����� 59.�� �������� Hosaka,M. & Sudhof,T.C. Synapsin III, a novel synapsin with an unusual regulation by Ca2+. J. Biol. Chem. 273, 13371-13374 (1998). ����� 60.�� �������� Ye,B. et al. GRASP-1: a neuronal RasGEF associated with the AMPA receptor/GRIP complex. Neuron. 26, 603-617 (2000). ����� 61.�� �������� Szebenyi,G. et al. Activity-driven dendritic remodeling requires microtubule-associated protein 1A. Curr. Biol. 15, 1820-1826 (2005). ����� 62.�� �������� Bockers,T.M. et al. Synaptic scaffolding proteins in rat brain. Ankyrin repeats of the multidomain Shank protein family interact with the cytoskeletal protein alpha-fodrin. J. Biol. Chem. 276, 40104-40112 (2001). ����� 63.�� �������� Eastwood,S.L. et al. Altered expression of synaptic protein mRNAs in STOP (MAP6) mutant mice. J. Psychopharmacol. 21, 635-644 (2007). ����� 64.�� �������� Mason,J.L. et al. ATF5 regulates the proliferation and differentiation of oligodendrocytes. Mol. Cell Neurosci. 29, 372-380 (2005). ����� 65.�� �������� Zunner,D., Deschermeier,C., & Kornau,H.C. GABA(B) receptor subunit 1 binds to proteins affected in 22q11 deletion syndrome. Biochem. Biophys. Res. Commun. 393, 185-189 (2010). ����� 66.�� �������� Liu,A., Zhuang,Z., Hoffman,P.W., & Bai,G. Functional analysis of the rat N-methyl-D-aspartate receptor 2A promoter: multiple transcription starts points, positive regulation by Sp factors, and translational regulation. J. Biol. Chem. 278, 26423-26434 (2003). ����� 67.�� �������� Ma,L., Song,L., Radoi,G.E., & Harrison,N.L. Transcriptional regulation of the mouse gene encoding the alpha-4 subunit of the GABAA receptor. J. Biol. Chem. 279, 40451-40461 (2004). ����� 68.�� �������� Ramos,B., Valin,A., Sun,X., & Gill,G. Sp4-dependent repression of neurotrophin-3 limits dendritic branching. Mol. Cell Neurosci. 42, 152-159 (2009). ����� 69.�� �������� Enard,W. et al. A humanized version of Foxp2 affects cortico-basal ganglia circuits in mice. Cell. 137, 961-971 (2009). ����� 70.�� �������� Hisaoka,T., Nakamura,Y., Senba,E., & Morikawa,Y. The forkhead transcription factors, Foxp1 and Foxp2, identify different subpopulations of projection neurons in the mouse cerebral cortex. Neuroscience. 166, 551-563 (2010). ����� 71.�� �������� Konopka,G. et al. Human-specific transcriptional regulation of CNS development genes by FOXP2. Nature. 462, 213-217 (2009). ����� 72.�� �������� Groszer,M. et al. Impaired synaptic plasticity and motor learning in mice with a point mutation implicated in human speech deficits. Curr. Biol. 18, 354-362 (2008). ����� 73.�� �������� Nakatani,T., Kumai,M., Mizuhara,E., Minaki,Y., & Ono,Y. Lmx1a and Lmx1b cooperate with Foxa2 to coordinate the specification of dopaminergic neurons and control of floor plate cell differentiation in the developing mesencephalon. Dev. Biol. 339, 101-113 (2010). ����� 74.�� �������� Ji,H. et al. Tuning the excitability of midbrain dopamine neurons by modulating the Ca2+ sensitivity of SK channels. Eur. J. Neurosci. 29, 1883-1895 (2009). ����� 75.�� �������� Jacobsen,J.P. et al. SK3 K+ channel-deficient mice have enhanced dopamine and serotonin release and altered emotional behaviors. Genes Brain Behav. 7, 836-848 (2008). ����� 76.�� �������� Lee,S. et al. Essential role for the Prader-Willi syndrome protein necdin in axonal outgrowth. Hum. Mol. Genet. 14, 627-637 (2005). ����� 77.�� �������� Lu,B. et al. Peptide neurotransmitters activate a cation channel complex of NALCN and UNC-80. Nature. 457, 741-744 (2009). ����� 78.�� �������� Zhan,L. et al. ALG-2 interacting protein AIP1: a novel link between D1 and D3 signalling. Eur. J. Neurosci. 27, 1626-1633 (2008). ����� 79.�� �������� Scheuch,K. et al. Characterization of a functional promoter polymorphism of the human tryptophan hydroxylase 2 gene in serotonergic raphe neurons. Biol. Psychiatry. 62, 1288-1294 (2007). ����� 80.�� �������� Sunabori,T. et al. Cell-cycle-specific nestin expression coordinates with morphological changes in embryonic cortical neural progenitors. J. Cell Sci. 121, 1204-1212 (2008). ����� 81.�� �������� Graff,J., Koshibu,K., Jouvenceau,A., Dutar,P., & Mansuy,I.M. Protein phosphatase 1-dependent transcriptional programs for long-term memory and plasticity. Learn. Mem. 17, 355-363 (2010). ����� 82.�� �������� Xu,T.X. et al. Hyperdopaminergic tone erodes prefrontal long-term potential via a D2 receptor-operated protein phosphatase gate. J. Neurosci. 29, 14086-14099 (2009). ����� 83.�� �������� Li,L. et al. Serotonin(1A)-receptor-dependent signaling proteins in mouse hippocampus. Neuropharmacology. 57, 556-566 (2009). ����� 84.�� �������� Kim,S.M., Ahn,S.M., Go,B.S., Wang,J.Q., & Choe,E.S. Alterations in AMPA receptor phosphorylation in the rat striatum following acute and repeated cocaine administration. �Neuroscience. 163, 618-626 (2009). ����� 85.�� �������� Kanematsu,T. et al. Modulation of GABA(A) receptor phosphorylation and membrane trafficking by phospholipase C-related inactive protein/protein phosphatase 1 and 2A signaling complex underlying brain-derived neurotrophic factor-dependent regulation of GABAergic inhibition. J. Biol. Chem. 281, 22180-22189 (2006). ����� 86.�� �������� Terry-Lorenzo,R.T. et al. Neurabin/protein phosphatase-1 complex regulates dendritic spine morphogenesis and maturation. Mol. Biol. Cell. 16, 2349-2362 (2005). ����� 87.�� �������� Rex,E.B. et al. Identification of RanBP 9/10 as interacting partners for protein kinase C (PKC) gamma/delta and the D1 dopamine receptor: regulation of PKC-mediated receptor phosphorylation. Mol. Pharmacol. 78, 69-80 (2010). ����� 88.�� �������� Yin,Y.X. et al. RanBPM contributes to TrkB signaling and regulates brain-derived neurotrophic factor-induced neuronal morphogenesis and survival. J. Neurochem. 114, 110-121 (2010). ����� 89.�� �������� Bai,D., Chen,H., & Huang,B.R. RanBPM is a novel binding protein for p75NTR. Biochem. Biophys. Res. Commun. 309, 552-557 (2003). ����� 90.�� �������� Murrin,L.C. & Talbot,J.N. RanBPM, a scaffolding protein in the immune and nervous systems. J. Neuroimmune. Pharmacol. 2, 290-295 (2007). ����� 91.�� �������� Rao,M.A. et al. RanBPM, a nuclear protein that interacts with and regulates transcriptional activity of androgen receptor and glucocorticoid receptor. J. Biol. Chem. 277, 48020-48027 (2002). ����� 92.�� �������� Harikrishnan,K.N. et al. Alleviating transcriptional inhibition of the norepinephrine slc6a2 transporter gene in depolarized neurons. J. Neurosci. 30, 1494-1501 (2010). ����� 93.�� �������� Chiba,H., Muramatsu,M., Nomoto,A., & Kato,H. Two human homologues of Saccharomyces cerevisiae SWI2/SNF2 and Drosophila brahma are transcriptional coactivators cooperating with the estrogen receptor and the retinoic acid receptor. Nucleic Acids Res. 22, 1815-1820 (1994). ����� 94.�� �������� Hsiao,P.W., Fryer,C.J., Trotter,K.W., Wang,W., & Archer,T.K. BAF60a mediates critical interactions between nuclear receptors and the BRG1 chromatin-remodeling complex for transactivation. Mol. Cell Biol. 23, 6210-6220 (2003). ����� 95.�� �������� Levesque,D. & Rouillard,C. Nur77 and retinoid X receptors: crucial factors in dopamine-related neuroadaptation. Trends Neurosci. 30, 22-30 (2007). ����� 96.�� �������� Seshadri,S. et al. Disrupted-in-Schizophrenia-1 expression is regulated by beta-site amyloid precursor protein cleaving enzyme-1-neuregulin cascade. Proc. Natl. Acad. Sci. U. S. A. 107, 5622-5627 (2010). ����� 97.�� �������� Longart,M., Liu,Y., Karavanova,I., & Buonanno,A. Neuregulin-2 is developmentally regulated and targeted to dendrites of central neurons. J. Comp Neurol. 472, 156-172 (2004). ����� 98.�� �������� Dimayuga,F.O. et al. The neuregulin GGF2 attenuates free radical release from activated microglial cells. J. Neuroimmunol. 136, 67-74 (2003). ����� 99.�� �������� Petersen,P.H., Zou,K., Krauss,S., & Zhong,W. Continuing role for mouse Numb and Numbl in maintaining progenitor cells during cortical neurogenesis. Nat. Neurosci. 7, 803-811 (2004). ��� 100.�� �������� Li,H.S. et al. Inactivation of Numb and Numblike in embryonic dorsal forebrain impairs neurogenesis and disrupts cortical morphogenesis. Neuron. 40, 1105-1118 (2003). ��� 101.�� �������� Burns,B. �et al. Rai1 haploinsufficiency causes reduced Bdnf expression resulting in hyperphagia, obesity and altered fat distribution in mice and humans with no evidence of metabolic syndrome. Hum. Mol. Genet. 19, 4026-4042 (2010). ��� 102.�� �������� Savino,M.T. et al. Rai acts as a negative regulator of autoimmunity by inhibiting antigen receptor signaling and lymphocyte activation. J. Immunol. 182, 301-308 (2009). ��� 103.�� �������� Darcy,M.J., Calvin,K., Cavnar,K., & Ouimet,C.C. Regional and subcellular distribution of HDAC4 in mouse brain. J. Comp Neurol. 518, 722-740 (2010). ��� 104.�� �������� Chawla,S., Vanhoutte,P., Arnold,F.J., Huang,C.L., & Bading,H. Neuronal activity-dependent nucleocytoplasmic shuttling of HDAC4 and HDAC5. J. Neurochem. 85, 151-159 (2003). ��� 105.�� �������� Sugo,N. et al. Nucleocytoplasmic translocation of HDAC9 regulates gene expression and dendritic growth in developing cortical neurons. Eur. J. Neurosci. 31, 1521-1532 (2010). ��� 106.�� �������� Hirsch,E. et al. Defective dendrite elongation but normal fertility in mice lacking the Rho-like GTPase activator Dbl. Mol. Cell Biol. 22, 3140-3148 (2002). ��� 107.�� �������� Chen,N. & Napoli,J.L. All-trans-retinoic acid stimulates translation and induces spine formation in hippocampal neurons through a membrane-associated RARalpha. FASEB J. 22, 236-245 (2008). ��� 108.�� �������� Ponnio,T. & Conneely,O.M. nor-1 regulates hippocampal axon guidance, pyramidal cell survival, and seizure susceptibility. Mol. Cell Biol. 24, 9070-9078 (2004). ��� 109.�� �������� Ohkura,N., Hijikuro,M., & Miki,K. Antisense oligonucleotide to NOR-1, a novel orphan nuclear receptor, induces migration and neurite extension of cultured forebrain cells. Brain Res. Mol. Brain Res. 35, 309-313 (1996). ��� 110.�� �������� White,M.K., Johnson,E.M., & Khalili,K. Multiple roles for Puralpha in cellular and viral regulation. Cell Cycle. 8, 1-7 (2009). ��� 111.�� �������� Khalili,K. et al. Puralpha is essential for postnatal brain development and developmentally coupled cellular proliferation as revealed by genetic inactivation in the mouse. Mol. Cell Biol. 23, 6857-6875 (2003). ��� 112.�� �������� Haas,S. et al. A 39-kD DNA-binding protein from mouse brain stimulates transcription of myelin basic protein gene in oligodendrocytic cells. �J. Cell Biol. 130, 1171-1179 (1995). ��� 113.�� �������� Dugas,J.C. et al. Dicer1 and miR-219 Are required for normal oligodendrocyte differentiation and myelination. Neuron. 65, 597-611 (2010). ��� 114.�� �������� van der,L.S. et al. Neuroanatomical distribution and colocalisation of nuclear receptor corepressor (N-CoR) and silencing mediator of retinoid and thyroid receptors (SMRT) in rat brain. Brain Res. 1059, 113-121 (2005). ��� 115.�� �������� Perlmann,T. & Wallen-Mackenzie,A. Nurr1, an orphan nuclear receptor with essential functions in developing dopamine cells. Cell Tissue Res. 318, 45-52 (2004). ��� 116.�� �������� Chen,N. & Napoli,J.L. All-trans-retinoic acid stimulates translation and induces spine formation in hippocampal neurons through a membrane-associated RARalpha. FASEB J. 22, 236-245 (2008). ��� 117.�� �������� Jiang,P., Selvaraj,V., & Deng,W. Differentiation of embryonic stem cells into oligodendrocyte precursors. J. Vis. Exp.1960 (2010). ��� 118.�� �������� Steplewski,A. et al. MyEF-3, a developmentally controlled brain-derived nuclear protein which specifically interacts with myelin basic protein proximal regulatory sequences. Biochem. Biophys. Res. Commun. 243, 295-301 (1998). ��� 119.�� �������� Cai,H. et al. The sarcoglycan complex in Schwann cells and its role in myelin stability. Exp. Neurol. 205, 257-269 (2007). ��� 120.�� �������� Chan,P. et al. Epsilon-sarcoglycan immunoreactivity and mRNA expression in mouse brain. J. Comp Neurol. 482, 50-73 (2005). ��� 121.�� �������� Waite,A., Tinsley,C.L., Locke,M., & Blake,D.J. The neurobiology of the dystrophin-associated glycoprotein complex. Ann. Med. 41, 344-359 (2009). ��� 122.�� �������� Goryunov,D., He,C.Z., Lin,C.S., Leung,C.L., & Liem,R.K. Nervous-tissue-specific elimination of microtubule-actin crosslinking factor 1a results in multiple developmental defects in the mouse brain. Mol. Cell Neurosci. 44, 1-14 (2010). ��� 123.�� �������� Sanchez-Soriano,N. et al. Mouse ACF7 and drosophila short stop modulate filopodia formation and microtubule organisation during neuronal growth. J. Cell Sci. 122, 2534-2542 (2009). ��� 124.�� �������� Ge,X., Frank,C.L., Calderon,d.A., & Tsai,L.H. Hook3 interacts with PCM1 to regulate pericentriolar material assembly and the timing of neurogenesis. Neuron.� 65, 191-203 (2010). ��� 125.�� �������� Buchman,J.J. et al. Cdk5rap2 interacts with pericentrin to maintain the neural progenitor pool in the developing neocortex. Neuron. 66, 386-402 (2010). ��� 126.�� �������� Poirier,K. et al. Mutations in the neuronal ss-tubulin subunit TUBB3 result in malformation of cortical development and neuronal migration defects. Hum. Mol. Genet. 19, 4462-4473 (2010). ��� 127.�� �������� Chidambaram,S., Zimmermann,J., & von Mollard,G.F. ENTH domain proteins are cargo adaptors for multiple SNARE proteins at the TGN endosome. J. Cell Sci. 121, 329-338 (2008). ��� 128.�� �������� Xie,L.X., Calafat,J., Janssen,H., de,l., I, & Mollinedo,F. Intracellular location of syntaxin 7 in human neutrophils. Immunol. Lett. 129, 72-77 (2010). ��� 129.�� �������� Achuthan,A. et al. Regulation of the endosomal SNARE protein syntaxin 7 by colony-stimulating factor 1 in macrophages. Mol. Cell Biol. 28, 6149-6159 (2008). ��� 130.�� �������� Collins,R.F., Schreiber,A.D., Grinstein,S., & Trimble,W.S. Syntaxins 13 and 7 function at distinct steps during phagocytosis. J. Immunol. 169, 3250-3256 (2002). ��� 131.�� �������� Mullock,B.M. et al. Syntaxin 7 is localized to late endosome compartments, associates with Vamp 8, and Is required for late endosome-lysosome fusion. Mol. Biol. Cell. 11, 3137-3153 (2000). ��� 132.�� �������� Mattera,L. et al. The E1A-associated p400 protein modulates cell fate decisions by the regulation of ROS homeostasis. Plos. Genet. 6, e1000983 (2010). ��� 133.�� �������� Lan,H.C., Li,H.J., Lin,G., Lai,P.Y., & Chung,B.C. Cyclic AMP stimulates SF-1-dependent CYP11A1 expression through homeodomain-interacting protein kinase 3-mediated Jun N-terminal kinase and c-Jun phosphorylation. Mol. Cell Biol. 27, 2027-2036 (2007). ��� 134.�� �������� Rochat-Steiner,V. et al. FIST/HIPK3: a Fas/FADD-interacting serine/threonine kinase that induces FADD phosphorylation and inhibits fas-mediated Jun NH(2)-terminal kinase activation. J. Exp. Med. 192, 1165-1174 (2000). ��� 135.�� �������� Hu,M. et al. Histone H3 lysine 36 methyltransferase Hypb/Setd2 is required for embryonic vascular remodeling. Proc. Natl. Acad. Sci. U. S. A. 107, 2956-2961 (2010). ��� 136.�� �������� Ramadan,S. et al. p73 induces apoptosis by different mechanisms. Biochem. Biophys. Res. Commun. 331, 713-717 (2005). ��� 137.�� �������� Rossi,M., Sayan,A.E., Terrinoni,A., Melino,G., & Knight,R.A. Mechanism of induction of apoptosis by p73 and its relevance to neuroblastoma biology. Ann. N. Y. Acad. Sci. 1028, 143-149 (2004). ��� 138.�� �������� Bourdon,J.C., Renzing,J., Robertson,P.L., Fernandes,K.N., & Lane,D.P. Scotin, a novel p53-inducible proapoptotic protein located in the ER and the nuclear membrane. J. Cell Biol. 158, 235-246 (2002). ��� 139.�� �������� Jung,P. & Hermeking,H. The c-MYC-AP4-p21 cascade. Cell Cycle. 8, 982-989 (2009). ��� 140.�� �������� Becknell,B. et al. Hlx homeobox transcription factor negatively regulates interferon-gamma production in monokine-activated natural killer cells. Blood. 109, 2481-2487 (2007). ��� 141.�� �������� Gemelli,C. et al. The vitamin D3/Hox-A10 pathway supports MafB function during the monocyte differentiation of human CD34+ hemopoietic progenitors. J. Immunol. 181, 5660-5672 (2008). ��� 142.�� �������� Ge,X., Frank,C.L., Calderon,d.A., & Tsai,L.H. Hook3 interacts with PCM1 to regulate pericentriolar material assembly and the timing of neurogenesis. Neuron.� 65, 191-203 (2010). ��� 143.�� �������� Ho,S.N. Intracellular water homeostasis and the mammalian cellular osmotic stress response. J. Cell Physiol. 206, 9-15 (2006). ��� 144.�� �������� Goldman,M.B. The mechanism of life-threatening water imbalance in schizophrenia and its relationship to the underlying psychiatric illness. Brain Res. Rev. 61, 210-220 (2009). ��� 145.�� �������� Paytubi,S. et al. ABC50 promotes translation initiation in mammalian cells. J. Biol. Chem. 284, 24061-24073 (2009). ��� 146.�� �������� Wilkie,A.O.M. & Mavrogiannis,L.A. Enlarged Parietal Foramina/Cranium Bifidum. ��� 147.�� �������� Zhou,X., Qyang,Y., Kelsoe,J.R., Masliah,E., & Geyer,M.A. Impaired postnatal development of hippocampal dentate gyrus in Sp4 null mutant mice. Genes Brain Behav. 6, 269-276 (2007).